I can’t express how much I really love the food scene in Singapore. As most of you all know, Singapore is made up of Chinese, Malay and Indian. Even though the Malay and Indian make up 22% of the total population in Singapore, their food are available in every parts of Singapore. For example, if you are in the US, I’m sure you can find Indian food but it is not as easy as getting it in Singapore. 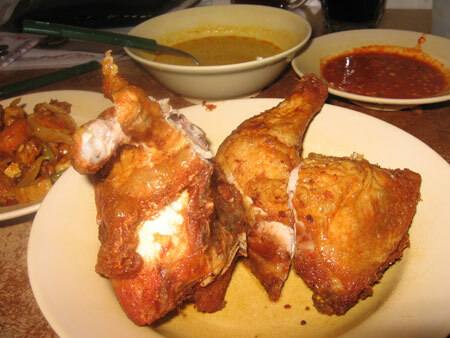 Singaporean from different ethnicity has good knowledge on each other dishes. It is safe to say that when it comes to food of Asean region, Singaporean are pretty familiar with almost all of it. Take this nasi padang joint for example. It is located in Hoy Fatt Road and most of the customers are Chinese. This proves that the Chinese in Singapore has already accepted Malay dish as their daily staple. 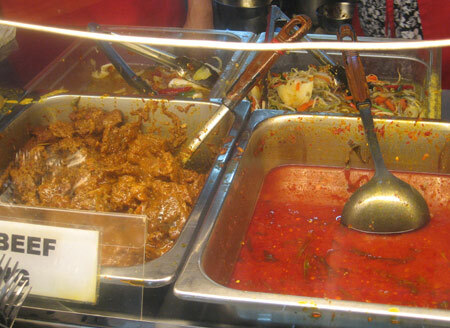 Is not something exotic anymore to them as they are very much exposed to Malay dishes. The name of the stall is Istimewa Nasi Padang. When I arrived with my friend at 1.30pm ( lunch break for most office workers ), the que was very long. I had to fall in line and waited for 10 minutes before I can choose my food. I am still new to taking pictures of people queing up and those who are enjoying their food. It seems kinda rude of me to take their pictures without their consent. However, I managed to snap some pictures of the stall and the food that I ordered. The owner of the stall ( a nice Malay lady ) did asked me why I was taking the picture of her stall. I just told her that I wanted to blog about it as her stall is very popular. She just smiled and told me that she thought I wanted to take pictures and complain about her stall. Beef rendang and Asam pedas side by side. Even though it is only 30 minutes into lunch break, most of the dishes are gone. 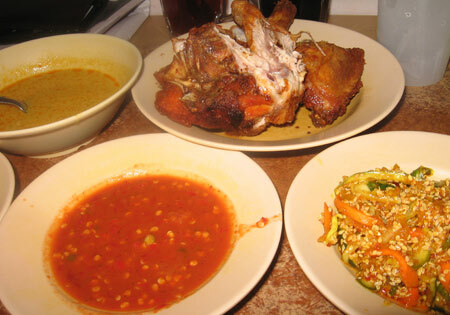 I ordered 2 pieces of fried chicken Malay style, one cucumber acar and sayur lodeh. I also asked for some sambal belacan and gulai ayam gravy ( gravy and sambal belacan is always given free in Malay stalls like this ). It cost us slightly below SGD10 with two plates of rice. Istimewa Nasi Padang’s Sambal belacan tasted really good. The mixture of belacan and chili are well balanced. The color looked like the Chicken Rice chili dip but I can assure you the taste is totally different. There are 2 ways of eating Nasi Padang. If you go alone, you just get a plate of plain rice and have all the dishes and gravy you want being placed on your plate of rice. If you go with a big group, you normally tell the server “makan hidang”. Makan hidang means that your dishes will be placed in individual plates for each dishes that you select. Then plain rice is being served separately. You can order hidang too if you go solo, but normally it will be slightly more expensive and not so practical.